My friend loved the game. I think if the others didn't show up we would have gone for round 2. He liked it a lot and was telling the others of how cool he thought it was. It's a very simple game really, and replay ability may be an issue, but I think it's extremely fun for what it is. It's kinda pricey but I got it in a trade so no complaints there. 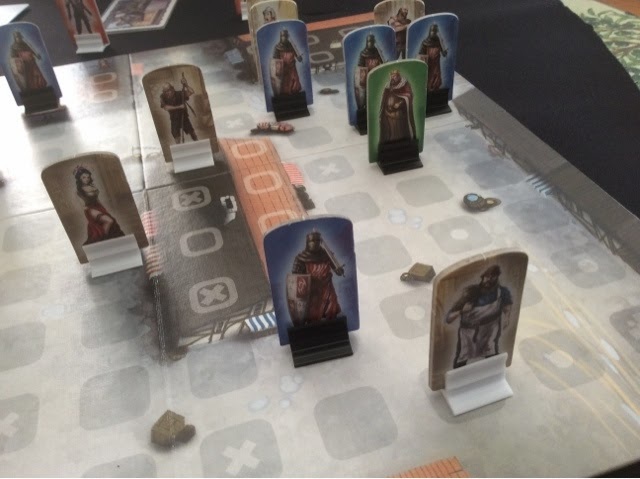 I took out the same prototype I played 2 weeks back. Something told me that this group would really like it and get into the game's theme. Well, I was right! They loved it. We played it back to back to back. The game is about looting stuff and stashing it away whereby the player with $500,000 worth of stashed goods will win the game. It's a really straightforward push your luck and take that game where each turn you either loot stuff or stash your current loot. The more loot you have, the more cops will come after you during your getaway. During the game, players use their cards to pimp their getaway vehicle or to hinder others during their getaway. The theme is easy to relate to as it's your typical movie style bank heist theme. There is a lot of back and forth that happens and luck of the draw plays it's part but it's really a filler style party game so it doesn't really matter that much. I'm surprised they liked it as much as they did and I think the game was really catered to them. A big thumbs up from them and it had them talking about it even after the game was well and over. I'll probably want to play it another time before I do a preview or review of it. Keep a lookout! I wasn't intending to table this game on Saturday but the presence of the 4th player kinda compelled me to give it a shot. This was another game that I thought would go well with this group. I was wrong. They hated it. Haha. Common comments were "too random", "no thought required", "complete lack of control". 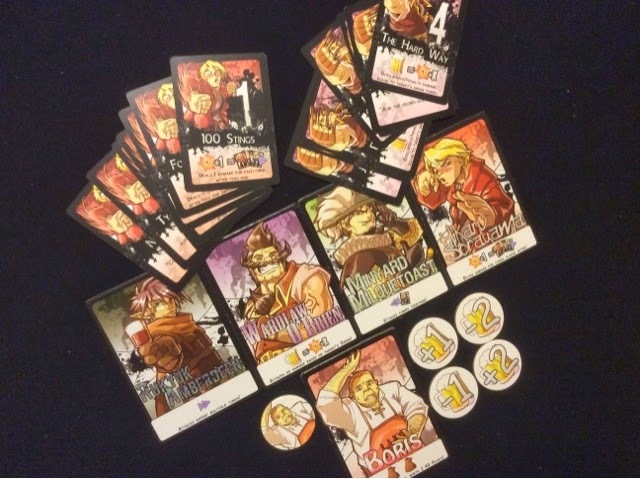 In 7 Card Slugfest, players play the role of a bar brawler and try to play their 7 cards quickly and timed correctly so that they can lay the knockout punch on another character or on Boris the bartender. The game is extremely chaotic with cards flying around and a round is over in less than 2 mins. Each card has a power value that will all add up to see if the character it is played on gets knockout or not. The abilities of the characters are nice and very varied but definitely unbalanced. I actually enjoyed it because I knew what to expect going in, but I don't expect them to want to play this anytime soon. We just can't get enough of this game!! Haha. I think this is my group's favorite cooperative game. Their eyes light up at the notion of playing the game. They are dying to survive (haha) and to explore the different scenarios in the game. This time round we played scenario 6 - Robinson Family. I expected this scenario to be hard, and on the onset it was. Building 9 inventions was no easy task and building all the camp requirements needed a lot of wood. We decided to use fur for the shelter but after 3 successful hunts, we had only gotten 3 furs. That really held us back for awhile as we expected much more fur income. 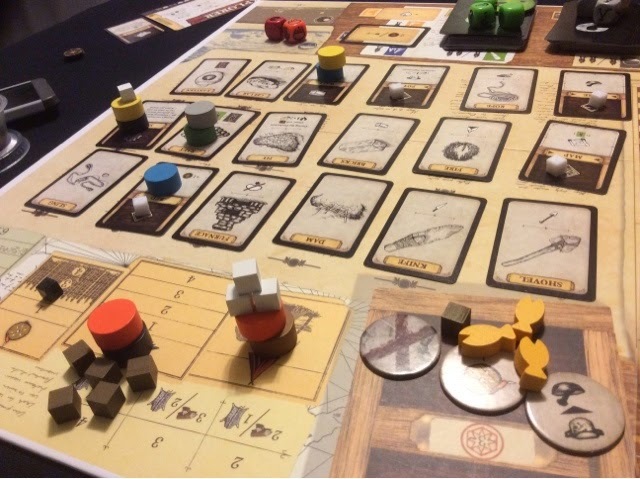 Food was also tough as our 3 hunts were small animals and our explored tiles were mainly wood resource tiles. Our saving invention was the pit. Amen hallelujah! That invention is possibly my favorite and such a life saver. 2 food per round (with successful dice roll) is such a blessing. We failed a few times but mostly benefited from it. Health was never an issue and we knew we just needed enough resources and time to get through the scenario. We succeeded 8 rounds into the 12 rounds scenario due to a rather fortunate adventure card from the previous round that gave us 3 more wood. Exactly what we needed to do a mad rush of invention building and camp building. On the 8th round we built our camp, our roof and 3 inventions to win the game. There was much cheer all around. A very successful attempt at family building. A male explorer, male soldier, male carpenter, and a female cook. Man she must have been busy. Haha. No it's not a sexist thing, we just took our cards randomly and whichever side up that was facing us. 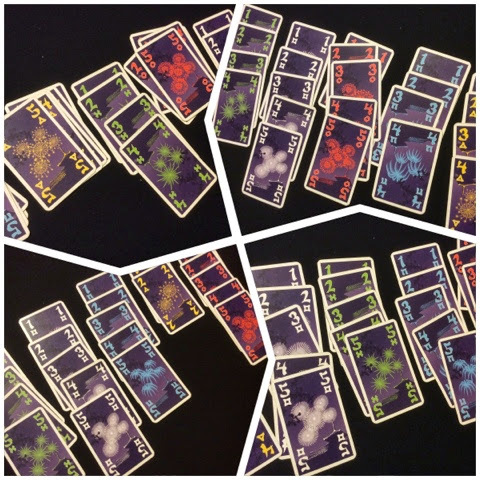 How many times can you score 22 in Hanabi in a row? For us, the answer was 5 times. Well, better luck next time guys. Hope you reach it cos the feeling is oh so good! That was my Saturday. I was actually hoping to table Mice & Mystics but the presence of the unexpected 4th made me scrap the plan. M&M is possibly best with 4 but seeing he wasn't as experienced and I don't think he will be over that often made me decide to start the campaign another time. I am itching to play it though. It's been on my shelf forever. 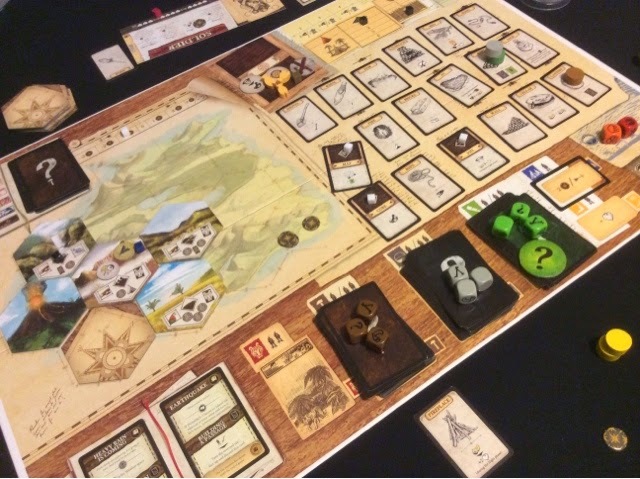 And yes, I taught the new guy Robinson Crusoe and not Mice & Mystics because I find M&M much tougher to teach as the rules aren't as intuitive nor thematically driven as compared to RC. Anything with line of sight and specific enemy placement & reactions and initiative orders always seem to make me want to rip up rulebooks. 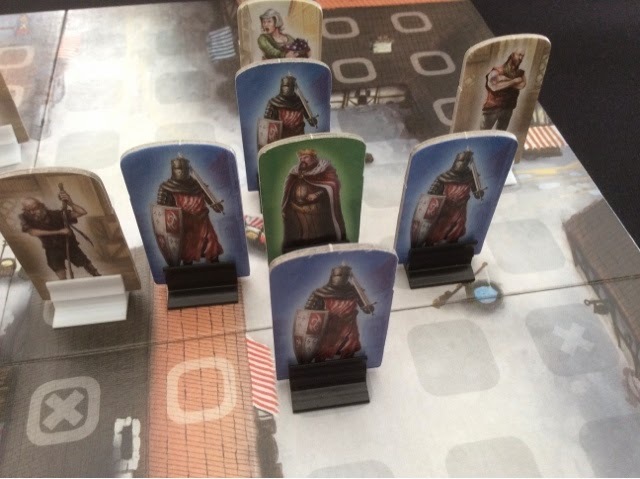 All these additional scenario rules and terrain rules and yadder yadder sometimes discourage me from teaching a game. Too many opportunities to miss out on a rule or get a rule wrong. But well, next time. I was hyped up on Saturday but I guess it'll have to wait!